BACKGROUND: According to the recent report by the Ministry of Statistics in India, number of elderly accounts for 8.6% of the country's population. Aging causes biological as well as psychological changes. Decline in cognitive functions is one of the normative changes of aging; however, this may impact both physical and mental health of an individual. Quality of Life (QoL) is one of the prime features of successful aging. Hence, this study was undertaken to correlate the level of cognition and QoL in older adults. 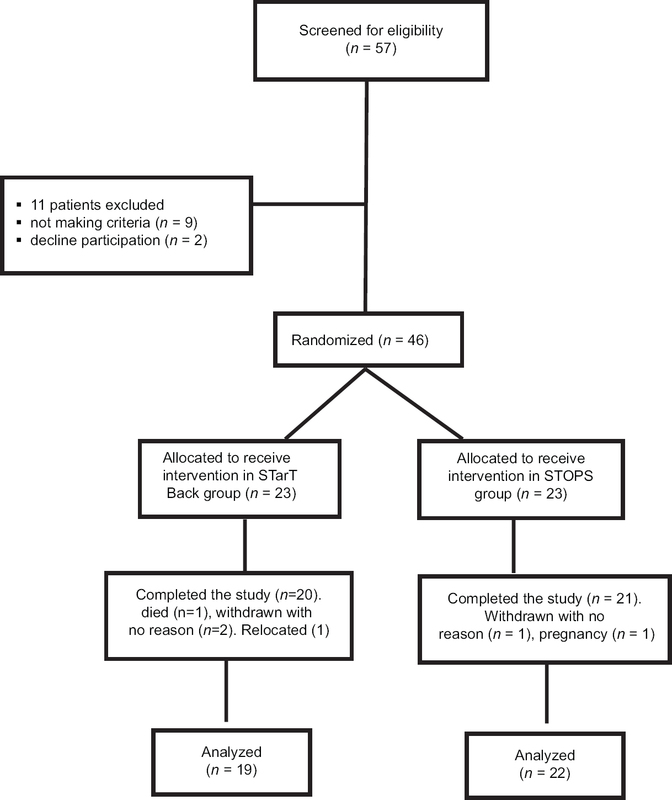 METHODOLOGY: One twenty-nine males and females of age 60–75 with or without cognitive impairment were selected using convenience sampling, those who could not read Hindi, who had any unstable medical condition, whose vision could not be corrected to normal level, and those with impaired speech were excluded from the study. Montreal cognitive assessment (MoCA) was administered to assess the cognitive level. QoL was assessed by QoL-Alzheimer's disease (AD) scale. RESULTS: Result indicated that there is a moderate positive correlation between MoCA and QoL-AD with r = 0.465 and P < 0.05. CONCLUSION: The study concludes that the level of cognition and QoL of older adults are moderately in positive correlation with each other. CONTEXT: Reaction time (RT) is one of the important components of physical fitness. Evaluation of RT is vital to understand and plan a training program. There is a need to comprehend the normative values of RT in young adults in different functional postures, which will enable the clinician to plan the fitness program effectively. AIMS: The aim of this study was to observe the RT in sitting and standing postures among typical young adults. SETTINGS AND DESIGN: This was an observational study. SUBJECTS AND METHODS: Sixty-five young Indian men and women students from a college at Mysore were included in the study. The participants' dominant hand was used to assess the RT in standing and sitting postures with their dominant hand. With the given distance, the RT was then calculated using standard conversion formulae. STATISTICAL ANALYSIS USED: The RT between standing and sitting was analyzed using mean, standard deviation (SD), and paired t-test. RESULTS: The RT analyzed for 22 men in sitting showed excellent RT with a mean 0.1188 (SD 0.0455) and 0.0929 (SD 0.0385) in sitting and standing postures, respectively. Women (n = 43) in sitting had a good RT with a mean of 0.1401 (SD 0.0314) and in standing an excellent RT with a mean of 0.1092 (SD 0.0323). Men had better performance when compared with women, both in standing and sitting postures. Paired test for standing and sitting showed significant difference with t value of 5.364 and P < 0.005, with reduced RT in standing. CONCLUSIONS: The study concludes that the RT is comparatively reduced in standing than in sitting among the young adults. BACKGROUND: Stratified Back care is a recently developed method for treating low back pain. PURPOSE: This study compared the effects of two stratified care approaches (sub-grouping for targeted treatment [STarT] and specific treatment of the problems of the spine [STOPS] in patients with nonspecific low back pain [NSLBP]). MATERIALS AND METHODS: Forty-six individuals, with NSLBP, participated in this single-blinded, randomized clinical trial. Participants were randomly assigned into one of the two groups: STarT Back Group (n = 23) or STOPS group (n = 23). Treatment was applied twice weekly for 8 weeks. Outcomes assessed pre- and post-interventions were pain intensity (PI) using numeric pain rating scale and functional disability (FD) using the Oswestry Disability Index. Participants in both groups were comparable in age (44.65 ± 9.03 vs. 46.40 ± 7.39) years. At baseline, PI, FD, and anthropometric values were comparable in both groups. RESULTS: The Results showed a significant difference in PI between the STarT and STOPS with a mean difference of −1.24 and 95% confidence interval (−0.86 to −0.04), P < 0.05, with no significant difference in FD, P > 0.05 between the groups. However, there was a significant difference within each group in pain and FD with P < 0.05. CONCLUSION: It was concluded that STarT Back approach was more effective in reducing PI only than STOPS approach in individuals with NSLBP. 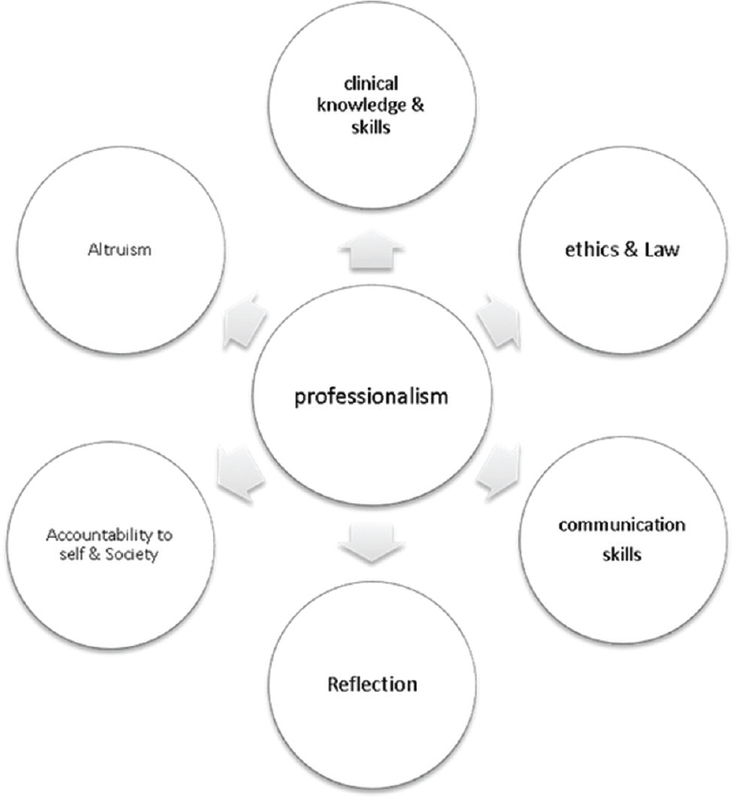 INTRODUCTION: Professionalism describes the skills, competency, attributes, and behavior of an individual belonging to a profession. The physiotherapy graduate on completion of internship has direct access with the community as a professional. Hence, there is a need to explicitly teach and assess professionalism. The purpose of this study was to prepare a module to enhance professionalism and use tools to assess the professional attributes uniformly. MATERIALS AND METHODS: A module was formulated with the help of experts, literature review, and guidelines of various physiotherapy regulatory bodies nationally and internationally. Focused group discussions were used as a method to identify competencies. After designing the module, a prospective intervention trial was conducted wherein 40 students who joined the internship program of a tertiary care hospital of India, were enrolled for the study. A participatory approach was used which included an interactive workshop on “ethics in clinical practice, communication skills, and professionalism.” A written pre-post evaluation and workplace-based assessment were carried out in four core physiotherapy areas. Competencies and attributes were measured using tools such professional mini-evaluation exercise (P-MEX), prevalidated checklist for clinical reasoning, patient feedback form, and a retro-preevaluation of self-assessment form of the American Physical Therapy Association. RESULTS: A total of 34 students completed the module. Data were analyzed using SPSS 16 software. Nonparametric Wilcoxon Signed Rank test was used to analyze the descriptive data. The statistical significance was kept at P < 0.05 at a confidence interval of 95%. There was a statistically significant increase in the knowledge component pre-post analysis (P < 0.00). Change in professional attributes as measured by P-MEX showed a significant change in Doctor-patient relationship (P < 0.01) and interprofessional skills (P < 0.001) followed by reflective skills (P < 0.007) and time management skills (P < 0.003). There was also a significant difference in total patient feedback scores from baseline (P < 0.01). CONCLUSION: The module helped students gain the knowledge and skills required to communicate and handle difficult situations relevant to physiotherapy practice. BACKGROUND: Nowadays more attention is being given to standardizing the outcome measures for improving treatment methods for chronic low back pain (CLBP). The Gujarati translation of the Tampa scale of kinesiophobia (TSK) in patients with CLBP has never been validated in the native Gujarati population. 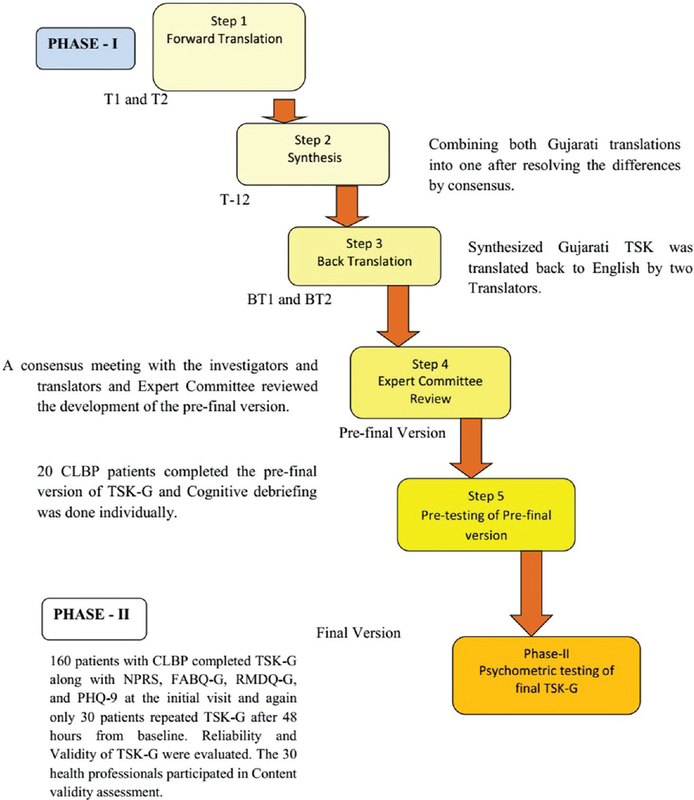 PURPOSE: Translating, culturally adapting, and validating the Gujarati version of the TSK-Gujarati (TSK-G) to allow its use for Gujarati-speaking patients with CLBP. MATERIALS AND METHODS: The development of the TSK-G questionnaire involved its translation and backtranslation, a final review by an expert committee, and testing of the pre final version in establishing its correspondence to the original English version. The psychometric testing included reliability by internal consistency (Cronbach's α), test-retest reliability (intraclass coefficient correlation [ICC]), convergent and divergent validity (Pearson's correlation) by comparing TSK-G to a numerical pain rating scale, fear-avoidance beliefs questionnaire (FABQ), the Roland Morris disability questionnaire (RMDQ), and patient health questionnaire-9 (PHQ-9); and factor analysis. RESULTS: Factor analysis indicated a 6-factor 17-item solution (64.07% of explained variance). The questionnaire showed satisfactory internal consistency (0.639) and moderate test-retest reliability (ICC 0.696). Divergent validity showed low correlations with numerical pain rating scale (r = 0.044), the RMDQ-G (r = 0.06), and PHQ-9-G (r = 0.269); but convergent validity showed highly significant correlation with FABQ-G (r = 0.407, P = 0.001). CONCLUSION: The successful translation of TSK questionnaire into the Gujarati language shows good psychometric properties and factorial structure and approximates the results of the current English version of the TSK questionnaire. Ankylosing spondylitis (AS) is a relatively uncommon inflammatory arthritis that affects the axial joints. The diagnosis is often missed and markedly delayed. 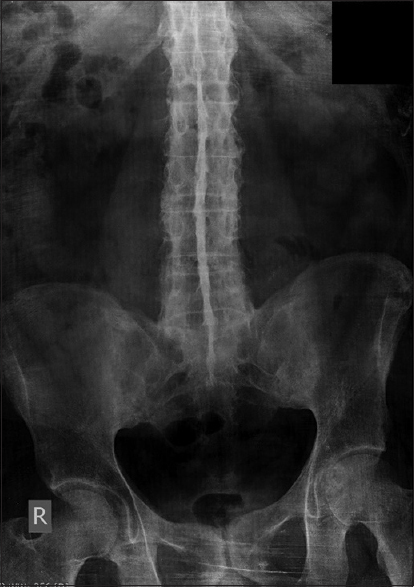 Here, we report a delayed diagnosis of AS in a 47-year-old male, 10 years after the onset of back symptoms, using the modified New York criteria. 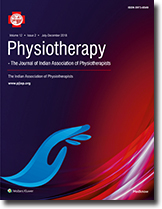 The objective of this case report is to outline the long-term effectiveness of physiotherapy interventions. The condition was managed with supervised physiotherapy intervention and unsupervised home exercises for 3 months and was followed for 1 year to investigate the long-term effectiveness of the interventions. It was found that the combination of supervised physiotherapy interventions and unsupervised home exercises had promising short term as well as long-term effects without deterioration in AS symptoms with increased patient satisfaction and confidence. Children suffering from hemiplegic cerebral palsy (CP) develop developmental disregard (DD). In addition, they fail to comprehend the consequences of nonuse. The utility of affected upper limb is jeopardized. Current evidence supports the use of constraint-induced movement therapy (CIMT) for upper limb function in individuals with hemiplegia. This single-case study attempts to identify feasibility of application of pediatric CIMT on a child with hemiplegic CP. The aim of this study is to identify the benefits and feasibility of application of CIMT for improving quality of the upper limb movement in a child with hemiplegic CP. 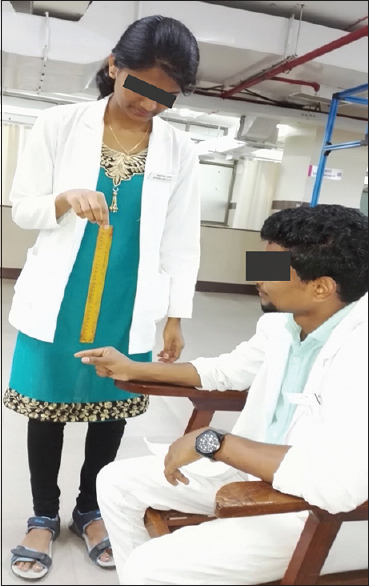 A 2½-year-old girl with hemiplegic CP visited the outpatient department (OPD) with the problem of lack of use of the right upper limb for activities and play along with the poorer quality of the upper limb movement. Disregard index was calculated to identify the presence of DD. CIMT was chosen as the child had above minimal ability to open fingers and extend the wrist. A 2-week intervention was designed based on the goal-oriented, ability-specific, child-specific practice of functional tasks. A rigid tape was used to provide constraint. The child was motivated to play with the affected hand for 2 h in the OPD and 2 h at home. Tasks of incremental difficulty were utilized as shaping method. The improvement in the quality of movement was measured using quality of upper extremity skilled test (QUEST) and Assisting Hand Assessment (AHA). The score on QUEST improved from 66.35 to 72.1, AHA improved from 66 to 73, and the disregard index score improved from 42.75 to 26.3 in 2 weeks. The treatment was adjusted to accommodate the behavior of the child.